One might extrapolate that the death of a human being – a young teenage woman – is apparently of little or no importance when compared with a story illustrating how Gorilla Glue poses a low-risk danger to dogs’ health, at least that’s how it might appear when reading news from KSL. KSL.com ran two stories in as many days, one describing the ill effects Gorilla Glue can have on canines, and the other indicating that a young woman was accidentally shot in the head and killed by a negligent discharge of a firearm yesterday evening. Yet, the story involving the tragic loss of human life only amounted to a 90 word essay, while the doggie drama garnered a full 14x more attention, totaling 1,285 words in all. The story of a labrador who had ingested the honey-like glue spoke at length about the details of how the dog became sick over a few weeks time, underwent an operation, and eventually returned to health. Following the story were numerous tips for keeping your dog safe, healthy, and happy, all details which were apparently mined from the ASPCA website. Our question is simple: where are the safety tips and information for gun handling after the article which discusses the terrible loss of human life due to gun negligence, (which also stems from simple ignorance just like the glue incident)? Isn’t this a much bigger issue than all the world’s glue-eating dogs? Why doesn’t KSL (or the other media outlets) take time to list out, for example, the four rules of gun safety, or point to websites that teach parents to educate children on matters of safe gun handling and respect? The disparity between these two topics on a site such as KSL’s makes the answer ever more clear: the liberal media wants you and I to think guns are the problem, and that the only solution is to rid ourselves of these dangerous threats permanently. Fortunately, we have an extensive amount of data from both the UK and Australia’s gun control scheme to know that less guns means more crime (in the UK, violent crimes skyrocketed after guns were banned – to a rate of more than 10 times that of some our most violent cities here in the US), and we also learn that when you take the guns away from law-abiding citizens, you simply create more victims for the criminals who will never disarm. It’s upsetting to see the subtle (and not so subtle) attack on human rights and our basic freedoms by the left-wing liberal media simply because they fear that which they don’t understand. I myself grew up fearing guns. My parents taught me they were bad. Once I decided to learn for myself whether or not guns were volatile and evil, I soon realized that as with many tools, firearms have specific uses, purposes, and rules. If you disrespect any of these uses, purposes, or rules, you risk endangering the lives or safety of yourself and others. During my research, I have also noted that the same dangers exists with bodies of water such as pools or bathtubs, with dangerous drugs, substances, and chemicals, and with automobiles. Yet, nobody is calling for an out and out ban of bleach, bathtubs, or Buicks, when in fact all of these are far more responsible for death than annual firearm accidents, and in most cases, even all firearm deaths combined each year (suicides, murders, and deaths through negligence/accident). For instance, in 2005 there were a reported 43,667 automobile deaths in the U.S., compared with 30,694 gun-related deaths. 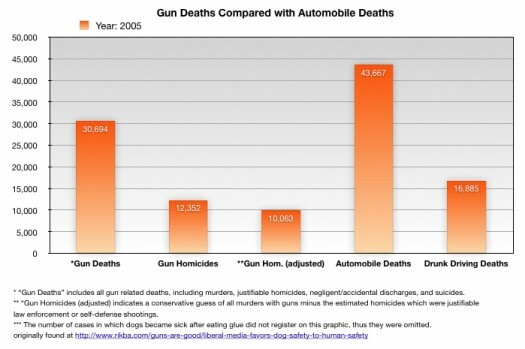 Of those automobile related deaths, 16,885 were a result of drunk driving, compared with gun related homicides which totaled 12,352 total deaths. However, this number includes homicides by law enforcement, and self defense (justifiable or excusable homicides), a total number which is best estimated to be between 2,000-3,000 of those total homicides. This means that drunk driving deaths are anywhere between 150%-200% higher annually than homicides, and 2,100% higher than gun accidents. Why not call for the banning of alcohol instead of stripping people of their God-given right and responsibility to defend themselves? Then again, prohibition didn’t seem to work, either. KSL and Nadine Wimmer have once again shown their true colors when it comes to dishonest, biased reporting. They simply abuse the power of their position in order to push their agenda to the unsuspecting public. Shame on you, KSL and Nadine Wimmer. Your bias is evident. You’re an insult to America, and an insult to Utah. You are currently browsing the archives for the Nadine Wimmer category.